An American flag was captured via livestream getting blown around by Hurricane Florence. The flag is located on the Frying Pan Shoals Light about 39 miles southeast of Southport, North Carolina. The Explore.org live camera shows that the flag has been torn apart due to Florence’s winds. Live footage shows extreme winds and severe waves crashing against the platform. The U.S. National Hurricane Center (NHC) said at 2 p.m. ET on Sept. 13 that the storm’s heavy rainbands and tropical-storm-force winds are spreading across the Carolinas. The NHC has issued storm surge and hurricane warnings for most of the coastlines North Carolina and South Carolina. “This large-scale feature is expected to keep the hurricane moving northwestward today, followed by a turn toward the west at a much slower speed on Friday as the ridge to the north of Florence weakens due to a weak shortwave trough dropping slowly southward from the Ohio Valley,” said the NHC in its discussion. After that, “Florence is forecast to turn toward the northwest and north around the western periphery of the subtropical ridge, and move across western South Carolina on Sunday, across western North Carolina and eastern Tennessee on Monday, and then move up the spine of the Appalachians as an extratropical” system, the agency added. North Carolina Gov. Roy Cooper called on local residents to remain alert despite changing forecasts. “Don’t relax, don’t get complacent. Stay on guard. This is a powerful storm that can kill. Today the threat becomes a reality,” he said, AP reported. North Carolina, South Carolina, Virginia, Maryland, and Georgia have all declared states of emergency over the storm. “Winds are already gusting above 40 mph, at times, along the North Carolina coast. Sustained winds of 53 mph and a gust to 70 mph was recorded at Fort Macon, North Carolina, early Thursday afternoon. 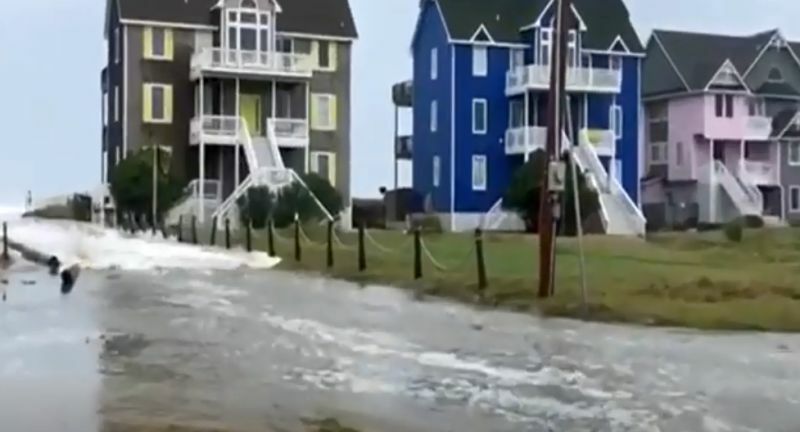 There’s already been overwash of the dunes at the S curves on Highway 12 near Rodanthe in the Outer Banks,” in North Carolina, The Weather Channel reported. The NHC noted: “The wind field of the hurricane continues to grow in size. This evolution will produce storm surges similar to that of a more intense, but smaller, hurricane, and thus the storm surge values seen in the previous advisory are still valid,” Fox News reported. “Life-threatening, catastrophic flash flooding and prolonged significant river flooding are likely over portions of the Carolinas and the southern and central Appalachians through early next week, as Florence is expected to slow down as it approaches the coast and moves inland,” said the NHC. And meanwhile, “A life-threatening storm surge is now highly likely along portions of the coastlines of South Carolina and North Carolina, and a Storm Surge Warning is in effect for a portion of this area. The greatest storm surge inundation is expected between Cape Fear and Cape Hatteras, including the Neuse and Pamlico Rivers and western Pamlico Sound,” the agency continued.